On this 2017 the latest known depths have been applied. 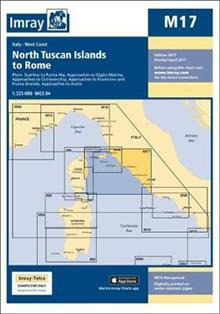 Harbour developments at Civitavecchia and Fiumicino are included as is the restricted area on the approach to Anzio. The Corsican Channel TSS is shown, as are the extents of Marine Protected Areas on this chart. The chart sp... read full description below. Chart scale 1:325 000Plans included:Scarlino to Punta Ala (1:85 000)Approaches to Giglio Marina (1:10 000)Approaches to Civitavecchia (1:40 000)Approaches to Fiumicino and Fiuma Grande (1:50 000)Approaches to Anzio (1:50 000)On this 2017 the latest known depths have been applied. Harbour developments at Civitavecchia and Fiumicino are included as is the restricted area on the approach to Anzio. The Corsican Channel TSS is shown, as are the extents of Marine Protected Areas on this chart. The chart specification has been improved to show coloured light flashes. There has been general updating throughout.